I wish you all a Happy Thanksgiving. I know, some of you readers may not be from the USA, but you can still be thankful, and certainly I can wish you well. As for you NaNoWrMo writers, you had your break, now get back to work. A QueryTracker user just sent me a link to this video (Thanks Lee) and I think it is the perfect theme song for QueryTracker. A question came up in the forum recently that I would like to address in a little more detail than I could there, and without the smilies, of course. One of our regulars brought up an interesting question. Why is it that when people critique other's work, they are always critical and rarely tout the positives of the work in question. Since words are writers' most basic tools, let's examine the word critique so that we all know what we are talking about. Merriam-Webster defines the word "critique" as: To examine critically, or: Review. Pretty straight forward, yes? But just to be sure, what does it mean to do something critically or with criticism? Again, Merriam-Webster says it is the art of evaluating or analyzing works of art or literature. Okay, so it is all about reviewing, evaluating or analyzing. So what do we do when we do these things? When someone evaluates your work, they are trying to determine the significance, worth, or condition of it by careful appraisal and study. Okay, I stole that from the dictionary again, but you see what I am getting at. They are scrutinizing your work and are looking for anything that might be wrong. Reviewing is really the same thing, so I won't give you another definition there, and analysis is the separation of a whole into its component parts. So as you can see, it is a process intended to study your work in depth and to see what is wrong with it, or determine its condition as stated above. This is a difficult experience for most of us who write, because in our minds we have created something we hope people will find breathtaking and wonderful, and then when we put it out there for people to see, all they seem to want to do is tear it apart. They tell us there are too many adjectives. The prose is too flowery. You use too many adverbs. Don't you think a sentence to describe the moon in the clouds would suffice instead of an entire paragraph? There is always something these people can find fault with! I wrote that stuff because I liked it, you know? Yeah they know, but if you are writing this stuff for yourself and you don't want to hear what they have to say, then you might as well not bother trying to get published. There will be a lot of theys between your first draft and your first edition, and they will all want something changed. And that is where your critique group or writing circle comes in. As a writer, you will need a group of people who understand your style and what you are trying to accomplish through your writing, but at the same time will not be afraid to tell you when something needs to go, because believe me, some of the stuff that you love so much needs to go. They are there to evaluate, review, and analyze your work. Listen to what they have to say, because this group of supportive, yet unrelenting critiquers will prepare you for the true difficulties you will be facing if your work ever does reach the hands of a professional editor. Don't expect any compliments on your turns of phrase from them, intrepid adventurers. These guys mean business. They will hack your manuscript to pieces and tell you to put it back together, only better this time. And then expect you to THANK them!! And you should be grateful to them, and to your critique group, because if your work has gone that far, it will be thanks to a group of people who were willing to risk the wrath of your artistic tantrums and spend the time and effort to help get you past the things you would not have been able to get past yourself. In my opinion, that's way better than, "I really liked your description of the moon in the clouds." Anyone can offer a compliment, but it takes real guts and effort to offer a well thought-out critique. P.S. 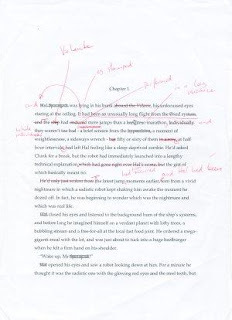 When I finished the first draft of this post, I left it for Patrick to review, evaluate, and analyze, and he critiqued my original work as being, "unfocused." Hopefully when you all help the writers in your writing circles, your critiques will be a bit more, umm... focused. And specific. But it was still very appropriate for the material, so I thought I would mention it. Carry on, and good luck to all you NaNoWriMo fanatics out there. (A note from Patrick. Jason, this is much more focused now. I'm glad I could help, and I am always thankful when a writer asks my opinions and then does not hate me for giving them. Not that I am a harsh editor or anything like that. Right Jason?